Animal In the House - Get it Out! 10.07.2005 - It usually starts with a late-night phone call. I'm one of the few wildlife trappers who 1)carries his phone with him at all times 2)answers it 24/7/365 3)has no life outside of wildlife removal to distract me. Thus, when that call does come in at 2:00 AM, I cheerfully answer it. This particular call came in at midnight. As usual, the caller didn't want to pay me to get out of bed, get dressed, and drive a half-hour away to remove the critter. They never want to pay me. That's okay, I don't mind, it's all part of the job. I simply tell them that they can come to my house when I get a water leak at 3:00 AM and do my plumbing. They agree, and all is settled. I arrived at this house to find an opossum backed in the corner. 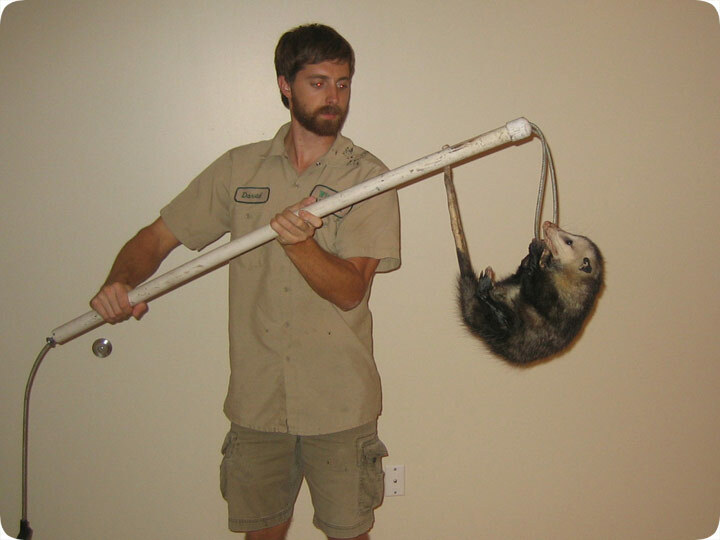 Opossums aren't smart or fast, so their best defense mechanism is to stand in the corner and bare their teeth. I got a holding cage and my trusty white snare pole and approached the beast. I attempted to snare it around the body, but that sneaky possum grabbed ahold of the snare loop and held on for dear life, preventing me from snaring it! No problem, I lifted the pole, and the animal grabbed the pole with its prehensile tail. Then the homeowner took a photograph of me. The easiest way to get an animal out of the house is usually to open all the doors and windows and let it go out on its own. But if the animal is tired or injured or just too confused to leave on its own, then the best way is to catch it with a safe snare pole and transport it to a carrying cage, which is what I do to ensure immediate removal. Most people would prefer not to have an animal in the house, but it's unlikely that the animal will attack. It probably wants to get out as much as you want it out. Most of the time, animals in homes are the result of openings from the attic space, where animals were living. So you should have a pro like me inspect the home and seal off all entry points. More Info: Visit my Rats in the Wall page if you hear scampering in the wall at night. Animals in walls - Animals like raccoons are cute critters, but they cause a real mess when they start to live inside your home. The majority of the time, the raccoon in your house is a female with babies. This makes trapping and removing her more complicated. The legal nature of the job is also complicated, and most states do not allow homeowners to trap raccoons without a license. Before you can think about removing the raccoon, you need to decide what you are going to do about the babies. Some females will remain in the attic or wall to protect their young; scaring the adult into a trap isn’t always possible. In this situation, the mother animal needs to be caught with a pole snare and pulled out of the wall and then put into a cage. This is one incidence where you can see why trapping is reserved for the professionals. Animals in the house can carry rabies, a fatal virus that is transmitted through infected saliva. While many other animals can be potential carriers, the raccoon is one species with a high incidence of the disease. On the off-chance that the raccoon in your walls is not a female, you’ll have to trap this animal as you would any other problem creature outside. Attach the trap to the roof near the entrance hole. Use bread or marshmallows as bait; meat will draw in too many other critters.